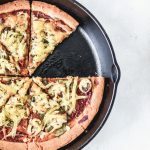 This gluten free pizza crust recipe tastes better than any gluten free pizza I’ve had in restaurants or tried at home. The texture is great with a crispy outside, chewy fluffy inside. It just can’t be beat! This isn’t my first attempt at a gluten free pizza crust recipe. I’ve tried countless times and the results have only been…meh. But recently I ordered a couple boxes of King Arthur’s Gluten Free All Purpose Flour from iHerb to see if it would work in my Gluten Free Bread Recipe. It worked so well that I decided to try out the gluten free pizza crust recipe on their website as well. 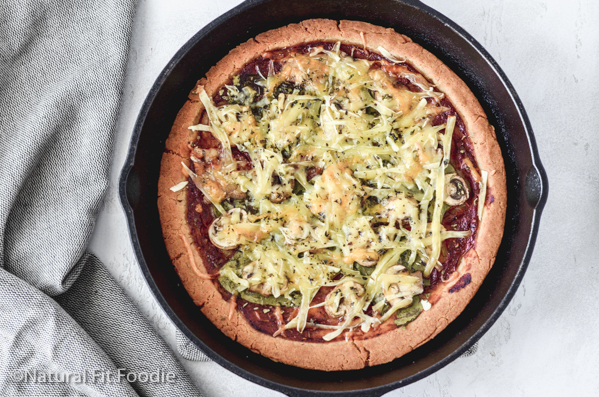 With a few adaptations and following the advice of some of the reviewers on the King Arthur recipe I can say that the result was MUCH better than any other gluten free pizza crust recipe I have ever tried and worthy of making its debut here on Natural Fit Foodie. 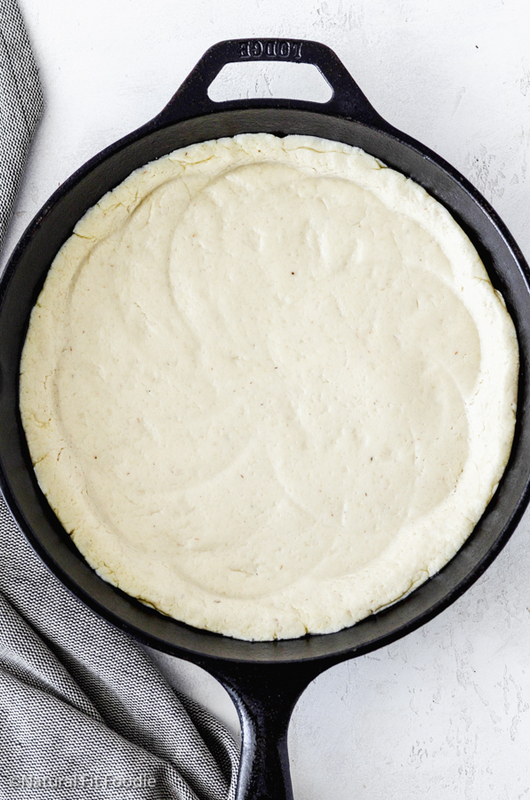 I think the best part of this Gluten Free Pizza Crust Recipe is the fact that it works with a wide variety of gluten free flour blends. If you read the comments on the original recipe on King Arthur’s site you will see that lots of people have used their favourite gluten free flour blend successfully. I myself have used this recipe using a gluten free flour blend that’s available locally in Spain and it works perfectly if not better. 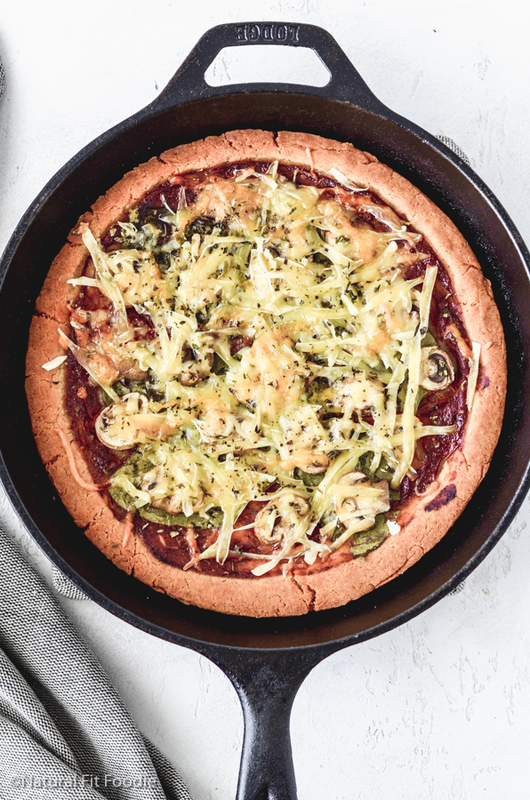 Learn to make a gluten free pizza crust you can be proud of! My daughters love pizza and if I would have to choose a favourite junk food, pizza would probably be number one. But just because we have gluten and dairy sensitivities in the family that shouldn’t mean that we can’t enjoy pizza right?! 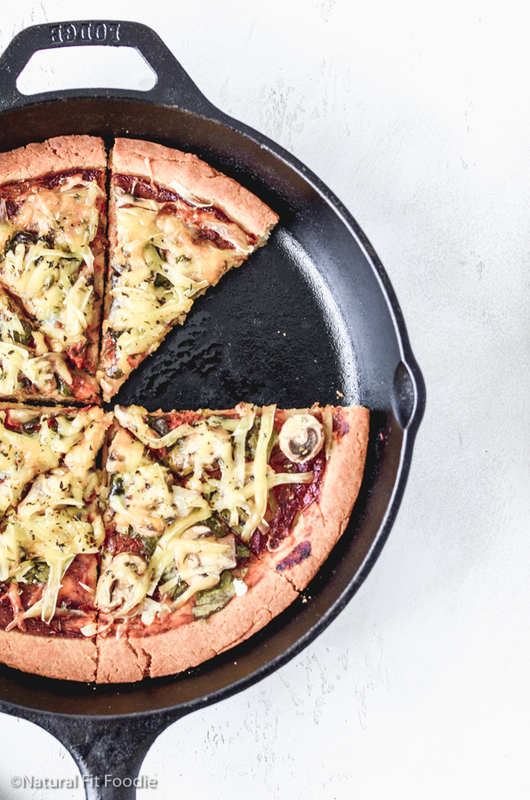 Let’s learn how to make gluten free pizza that you can be proud of! 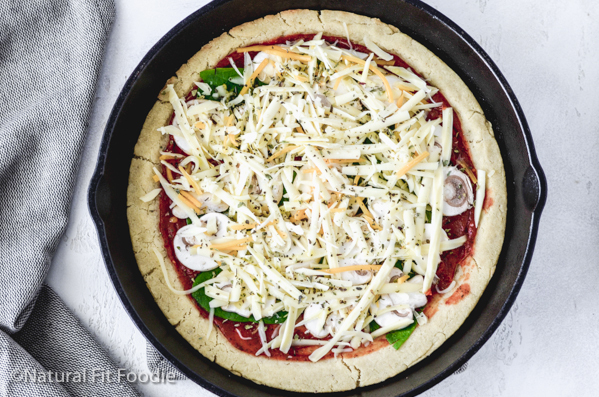 How to make Gluten Free Pizza Crust Step by Step from Scratch that’s dairy free, egg free, gum free. 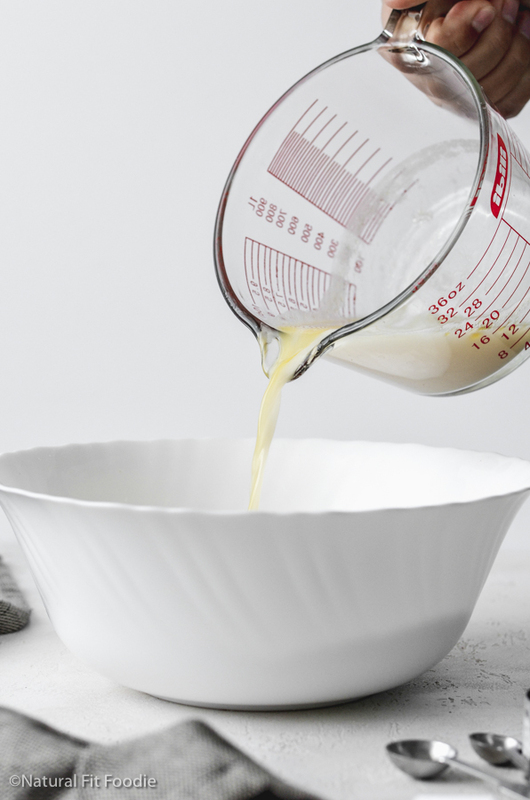 Place the wet ingredients and yeast in a glass pyrex dish and whisk to combine. Set aside for about 5 minutes until the mixture is frothy. 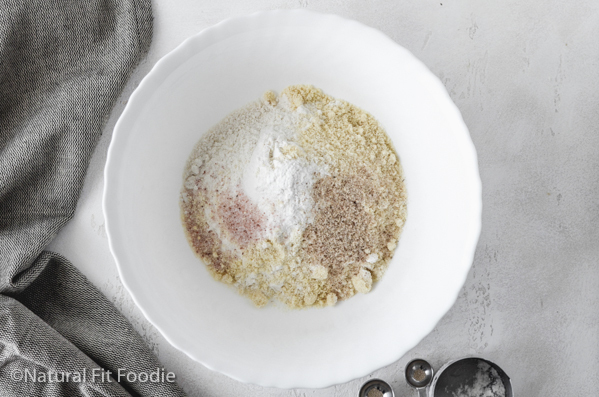 Combine the dry ingredients (minus the yeast because you already added it in the step above) into a large mixing bowl. Whisk thoroughly until blended with no lumps. You can do this in a stand mixer if you like. Make a small well in the middle of the dry mixture and pour in the wet mixture. 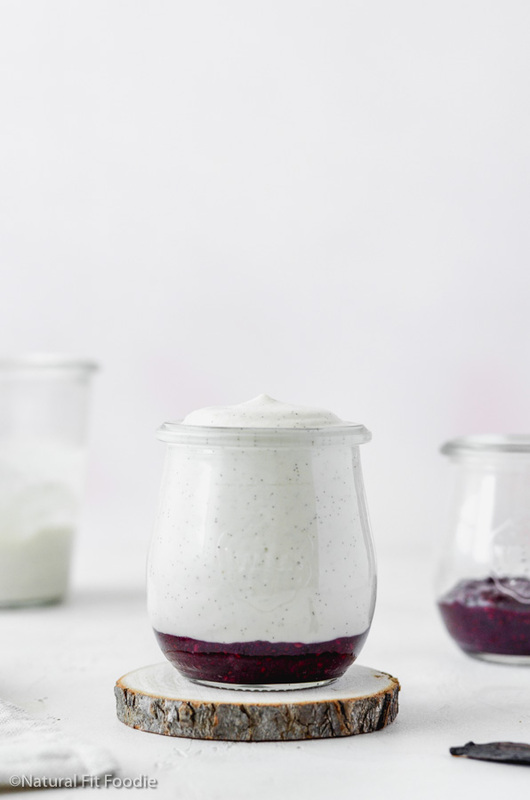 Using a silicone spatula mix until thoroughly combined. There is no risk of over mixing gluten free dough so mix, mix, mix. The folks over at King Arthur highly recommend using a stand mixer for this but I do not own one and mixed successfully by hand. The mixture will be thick and sticky, kinda like play dough. Once you’re done mixing, cover the bowl, and let the dough rest for 20 minutes or so. It will not rise like gluten dough does but it needs to rest. 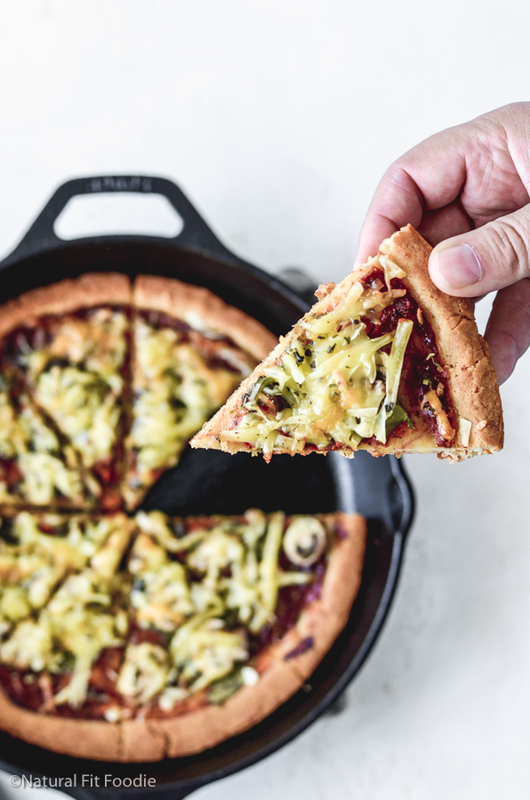 Drizzle 1 tablespoon olive oil onto the center of your cast iron skillet, baking sheet or baking pan. Remove the dough from the bowl and form a ball with your hands. 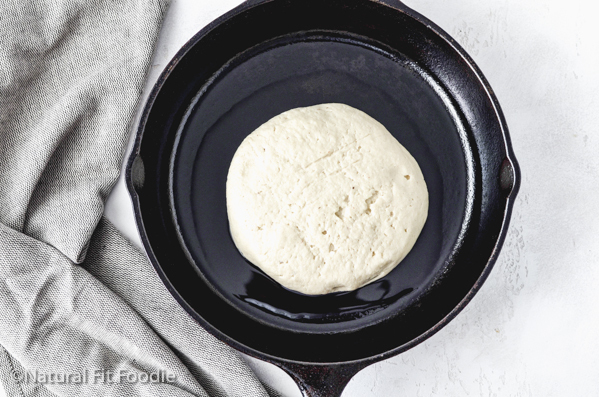 Place the dough ball into the center of your cast iron skillet onto the puddle of oil. DO NOT skip this step as it is what will make your pizza nice and crispy on the bottom. Add a touch of oil to the tips of your fingers and working from the center of the dough in an outwards direction, press the dough until flat. If your dough is way too sticky to manipulate with your hands place a sheet of parchment paper over the top and press out the dough that way. To get an even flatter more even surface I used my Lekue hamburger mold press. 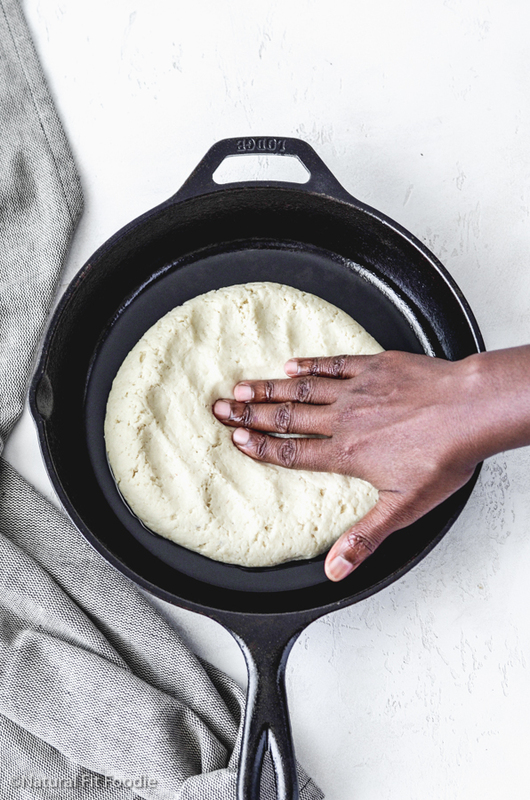 Let the dough rest in the skillet uncovered, for the length of time it takes your oven to preheat. NOTE: For a thick crust pizza allow you dough to rise in the skillet for 20 minutes. I personally prefer the thick crust version! Bake the crust for 15 minutes. Remove from the oven and add desired toppings. 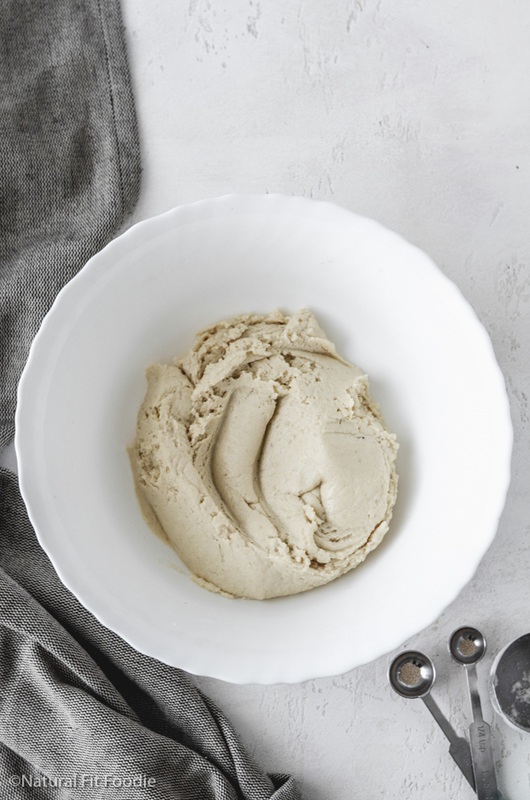 Please note : If you wish to freeze the dough for later now would be the time. You can also refrigerate the dough for using the next day at this point. Return to the oven to finish baking, for about 20 minutes. How many carbs are in gluten free pizza crust? The carb total will vary depending on the flours used in your gluten free pizza crust. But here is the nutrition label using the King Arthur Gluten Free All Purpose Flour Mix. Does gluten free pizza dough rise? Gluten free pizza dough DOES NOT rise like gluten dough does but it still needs time to rest. That said you still need to proof your yeast to ensure it is active and ensure it will do the work of making your dough light and airy. I myself tend to miss this step when bread making but with gluten free pizza crust proofing the yeast is essential. Can you freeze gluten free pizza dough? 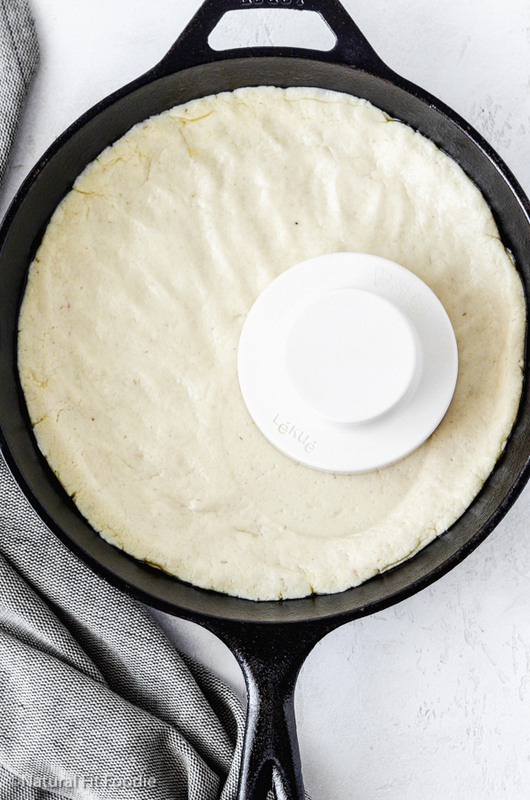 You can absolutely freeze gluten free pizza dough. To do that you would complete all the steps up to the first bake. After the dough has baked the first time you would allow it to cool then wrap it and freeze for up to a month. My freezer is pretty small so when I do freeze my gluten free pizza crust I tend to do mini pizza size dough rounds and store them in my Stasher bag. 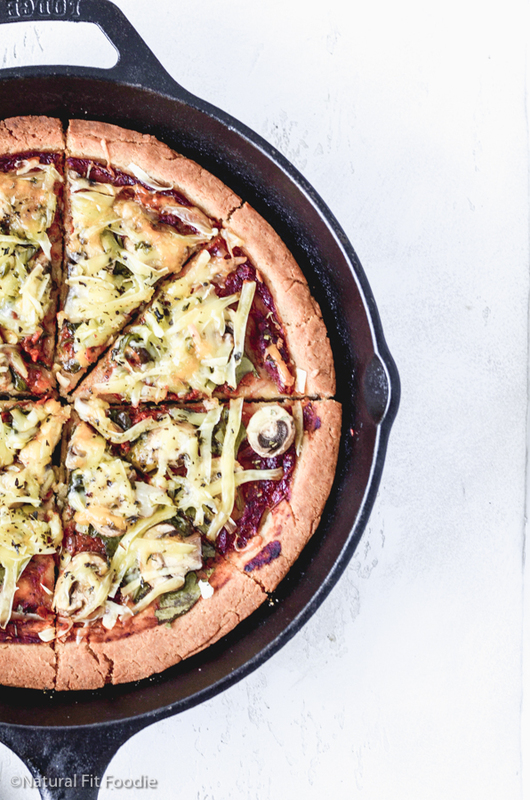 How to make gluten free pizza dough without xanthan gum? If you’ve baked gluten free goods before then you will know that in the absence of gluten you will need to add a binder. Xanthan gum is pretty good but some people are sensitive to it or find it impossible to buy. Eggs make an excellent binder but if you’re egg free then an egg replacement like psyllium husk powder is your best bet. Making Gluten Free Pizza step by step from scratch is a labour of love but in the end it takes just as long, or longer if you were to order out. That is if you even have the option to order such a pizza that’s gluten free AND also dairy free, egg free and gum free. 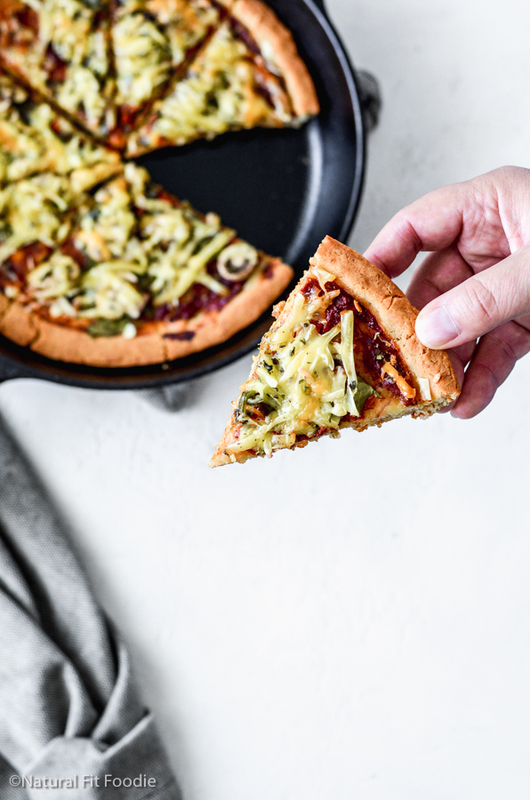 So tell me will you give this homemade pizza a try? This gluten free pizza crust recipe tastes better than any GF pizza I've had in restaurants or tried at home. The texture is great with a crispy outside, chewy fluffy inside. It just can’t be beat! 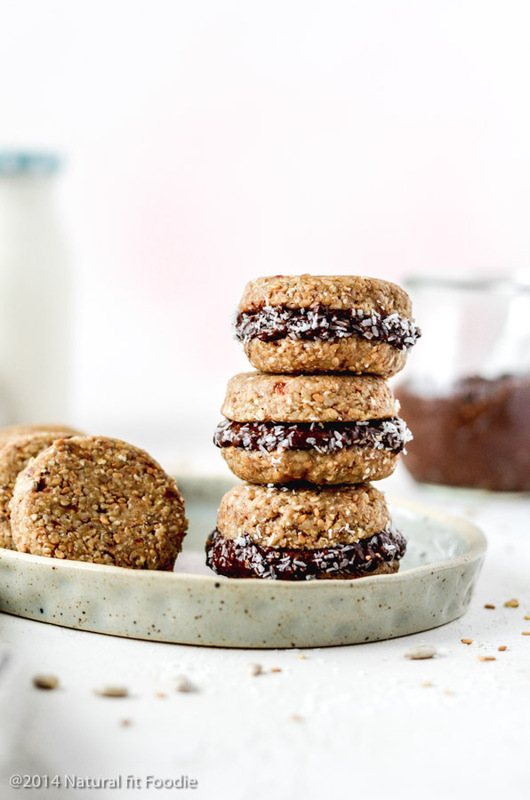 ¼ cup Almond flour (optional) Use ¼ cup more All Purpose flour if you do not have almond flour. 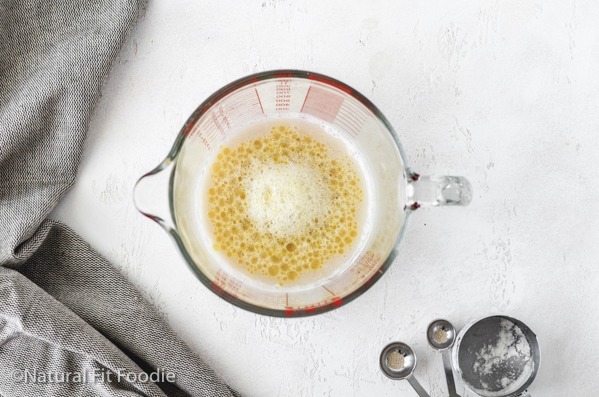 Make a small well in the middle of the dry mixture and pour in the wet frothy yeast mixture. Mix until thoroughly combined. There is no risk of over mixing gluten free dough so mix, mix, mix. The folks over at King Arthur highly recommend using a stand mixer for this but I do not own one and mixed successfully by hand. Cover the bowl, and let the dough rest for at least 20 minutes. It will not rise like gluten dough does but it needs to rest. To get an even flatter more even surface I used my Lekue hamburger bun press. NOTE: For a thick crust pizza allow you dough to rise in the skillet for 20 minutes. I have done it both ways with raving reviews from my family. Bake the crust for 15 minutes, just until it's set. Remove from the oven and add desired toppings. Or if you wish to freeze the dough for later now would be the time. You can also refrigerate the dough for using the next day at this point. Return to the oven to finish baking for 20 minutes.